Now that the Apple Watch's launch is behind us, we may finally have the opportunity to study its (early) impact. The lack of data certainly poses a challenge as Apple has declined to reveal sales figures of its new wearable. However, there are public resources, notably Google Trends, that could give us some measure of insight about how this launch compared to those of the iPhone and iPad. While Google search volumes may not necessarily reflect real-world sales with any degree of accuracy (my own work proves as much), it does give us some directional insight. 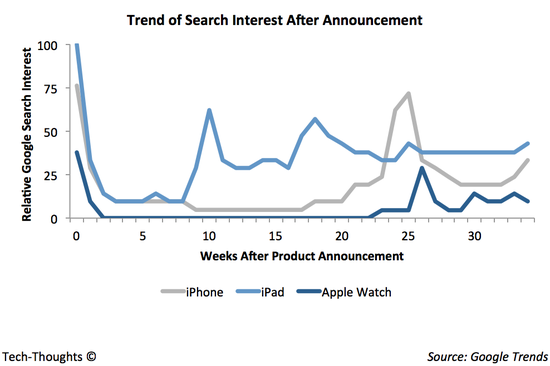 The chart above compares relative Google search volumes for the "iPhone", "iPad" and "Apple Watch" (or "iWatch") for three weeks around the event mentioned (week before, week of and week after). Relative to the iPhone and iPad, it appears that interest in the Apple Watch is considerably lower and has declined from the product's announcement to its launch. Google search volume for the Apple Watch was less than 50% of that for the iPhone and iPad around their announcement and roughly 20-25% of the iPhone and iPad at launch. Of course, this does not mean that initial sales for the Apple Watch will be lower than its predecessors. This is because the installed base of Apple products has grown over time and so has the number of loyal Apple users. As a result, the Apple Watch has access to a larger pool of loyal early adopters than its predecessors did. 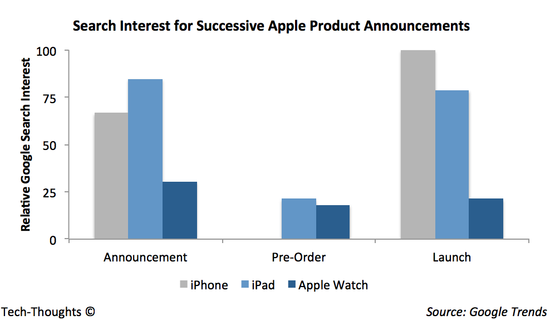 That said, this data does suggest that overall interest in the Apple Watch is lower than many analysts' expectations. And while Google search volume isn't necessarily scientific, its sample size is far larger than analyst surveys. Also, the pattern does have certain parallels with another chart comparing consumer interest in smartphones, tablets and wearables. Is it possible that interest in the Apple Watch was simply distributed differently? The following chart should answer that question. The chart above compares weekly Google search volumes for "iPhone", "iPad" and "Apple Watch" (or "iWatch") for about 35 weeks after their initial announcements. Compared to the iPhone or Apple Watch, the iPad had a much smaller gap between its announcement and launch, which boosted its performance. But even if we exclude the iPad, interest in the Apple Watch has been quite a bit lower than for the iPhone in 2007. Of course, the limitation of this data is that it only measures early interest. The real challenge facing the Apple Watch is generating sustained engagement. Research shows that a third of wearable device owners stop using them within the first 6 months and half stopped using them in 18 months. This implies that consumers don't just need to see value to purchase a wearable, but also need to see enough value to invest in charging it every day. This becomes even more difficult when we take into account the challenges developers are likely to face in building "new" smartwatch apps. Once users "forget" to charge their smartwatch, it's a slippery slope to abandonment.